Once you've added your team to HoneyBook, not only can they create and manage their own Projects, but you can easily assign any Projects or incoming Inquiries over to them as well! Then, your team member will be able to access the Project via their own Pipeline, and will be in full control of the Project. To automatically assign new Inquiries via the Contact form to a team member, follow the steps for customizing the Contact Form here, and select the appropriate recipient from the drop-down menu in your Preferences tab. If you're using multiple Contact Forms, you can even select a different assigned team members for each form. For existing Projects, there are two ways to assign: via the Project Pipeline view, or from within the Project itself. 1. From your HoneyBook home page, click the Projects tab. 2. Find the Project you're looking to delete—you can find it under All, or in the tab that corresponds to the Project's stage. 3. Click the 3-dot icon next to the Project. 5. Click to select the team member to whom you'll be assigning the Project. Your team member will receive an email notification of the assignment, along with a link to the Project for easy access. 1. Navigate to the Project that requires reassignment. 3. Select Assign to team member. 4. Click to select the team member to whom you'll be assigning the Project. PLEASE NOTE: As always, you and your team members will not be able to send messages or create new files in Projects if you are not owners of the Project OR have not been added as a participant to that Project. 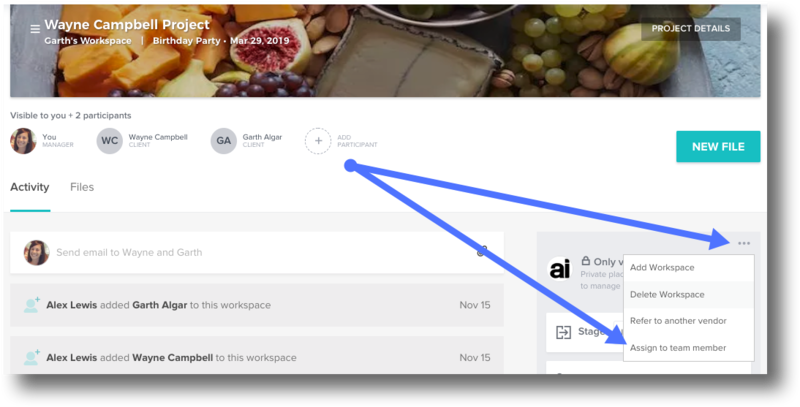 If you or you team members still need to be in the loop on a Project, make sure the new owner adds you or your colleagues as participants.